The new beauty treatment, coming from a spa in Japan, touts snail slime as the next, best weapon to fight off wrinkles and repair skin damage. Okay, lots of products and procedures promise this, but it’s the delivery method that’s a little … uh … creepy. Live snails are placed on the face and left to slither across for about 20 minutes. The promise is that the live snails deliver a highly potent antioxidant, via their snail slime, and that fresh is the best hence the necessity to allow live snails to crawl across one’s face. 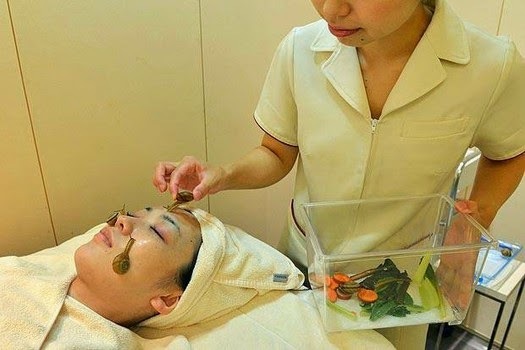 Snails are placed on a client’s cheeks and forehead and a therapist stays with the client ensuring the snails don’t wander too close to the eyes, nostrils or mouth. As they move around the skin they leave behind a trail of mucus, which is said to contain beneficial proteins. At the end of the facial the skin is cleansed and the pampered snails are placed in a luxurious cage to keep them content. Thinking that you’d like to try this? Perhaps you’ll snag a few of these critters from the garden. Oops, think again. Apparently the garden-variety snail just isn’t up to snuff, as somehow the snails from our lovely gardens have miraculously been contaminated. So, if you're looking to try this wonder cure for wrinkles prepare to pay $150. For those that are squeamish, there are a plethora of products that contain snail mucous. All creeping aside, the practice of using snails to treat the skin has been around since 400BC and according to some scientists’ snail mucous contains natural antibiotics and hyaluronic acid, which hydrates the skin increasing elasticity and reinvigorating the skin’s suppleness.